Just three days earlier, Hernandez had stood behind President Barack Obama at the White House as he announced a series of executive orders to curb gun violence. In 2011 when the January 8th shooting occurred, Hernandez was only 20 years old and had just started a new internship in the office of Congresswoman Gabrielle Giffords. He was helping out that day on his first meet-and-greet with constituents. When a gunman approached the congresswoman, shot her and strafed the surrounding crowd, killing 6 people and wounding another 12, Hernandez ran to Giffords and began first aid. He positioned her to assist her breathing, followed a local doctor’s lead in arguing against waiting for helicopter transport, and accompanied Giffords in the ambulance to the ER. The media designated Hernandez a hero, and he was widely credited with saving Giffords’ life. He insists his role was far more modest, and perhaps accolades are all the harder to accept after witnessing so much damage and loss of life. As I learned during our interview, praise was not the public’s only response. Overall, Daniel Hernandez’s career and Democratic party involvement, which constitute something of a conservative’s nightmare, reflect a broad political shift towards a “bluer” Arizona as young Latino voters come of age. He spent the last two years as an Arizona organizer for Everytown for Gun Safety, a group founded by former New York Mayor Michael Bloomberg to reduce gun violence. Recently, Hernandez joined the staff of Raiz, Planned Parenthood’s Latino community outreach program. 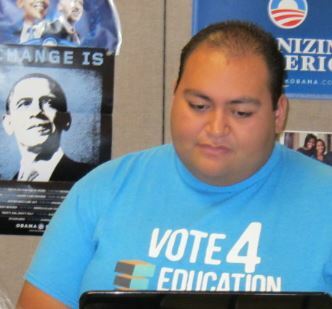 Now all of 25 years old, Hernandez is also President of the Sunnyside Unified School Board, where he’s served for 4 years helping oversee a large school district serving low-income neighborhoods on Tucson’s southeast side. 84% of the students qualify for free and reduced-price meals; 8% are homeless. Hernandez graduated from Sunnyside schools, today lives near the district offices and learned the medical skills he used to assist Giffords in a high school program. Those skills came in handy again just a few weeks after the shooting, when he jumped up to help a man choking at a restaurant and performed the Heimlich maneuver. Here are excerpts from my interview, conducted in his home, a tan stucco with freight trains rumbling nearby and a friend’s pug dog barking out back. You yourself were a part of a trauma, though you were concentrating on aiding others. How did you keep yourself together? I was in charge of signing people in. So every single person that was injured on that day with the exception of Judge Roll was someone that I signed in and I had talked to. Whether it was 2 seconds or 10 minutes, I had a conversation and an interaction with every single victim that was there — those that were injured, those that were killed. So it wouldn’t have helped for me to freak out and panic. It was about staying calm and using the limited training that I had until somebody else could come in with much better training. And that’s really what I was talking to myself about: ‘You can process this later, but right now you need to get this done.’ And then it was just about incredible focus and shutting off everything around me, except for what was in my immediate area. It wasn’t a very large space where everyone was injured, so I could still see and hear what was going on around me. But because I was with the Congresswoman, I wanted to focus just on her, after we made sure that Ron Barber [a wounded staff member] was being taken care of. I didn’t want something that I was doing to add to the level of trauma and chaos that was going on around me. In retrospect, do you think that you were in shock at the time but still functioning? I don’t think I was in shock. You know, there’s never really a way to prepare for something like this… I went straight from the incident to doing my first interview at 11 o’clock that evening with someone at The Arizona Republic, and… from then, I’ve done over 1,400 interviews… So, I was able to process things, but I was doing it in a much more public way than a lot of the other victims. So it was both very healthy and very unhealthy, the way that I had to process things, but most of it was out of my control. I don’t know what I can say prepared me for it, but I did 200 interviews in about a 48-hour period. I was being scheduled in 2-minute blocks at one point, because there were so many press requests, and I was walking from one end of the University lawn to the other, while on the phone doing another telephone interview. When something terrible happens, a narrative often forms really quickly: heroes, evildoers, who did what. And you had to cope with being dubbed the hero of the incident. What’s your perspective on that now? I think there’s a lot of folks who were involved that day who do not get anywhere near the recognition that I’ve received, and every time I just thank them, because they were such an integral part: Dr. David Bowman and Nancy Bowman, his wife, who were just shopping for Brussel sprouts, but came outside once they heard what had happened. [Dr. Bowman began triage in the critical 6 minutes before the first ambulances arrived.] We had folks like Patricia Maisch and Bill Badger [who helped tackle and disarm the gunman.] I can’t even begin to tell you how many folks really stepped up. But when I think about what’s changed, there is that amount of extra scrutiny that I get. And it’s not just for the 8th, but because I’m Hispanic, because I’m young, because I’m a member of the LGBT community. I feel I have been put on pedestals, and people are really looking forward to knocking off one of those legs of the stool. Is that actually something you’ve had to deal with, or is it just a concern? No, it’s been something that’s happened. When you get the kind of death threats that I’ve received. For example, Hernandez told me later, at the time of the January 8th gun rampage, he’d been findable online as a member of the Tucson city GLBT Commission advisory board. One of the first hate messages he received after the shooting was from an anti-gay caller who said no matter what good deed Hernandez had done helping save Giffords’ life, he was still going to burn in hell. People use words like recovery or healing, and I wonder what your reaction is to those words or how you’ve come to understand them. Personally, I think the last few years have been very difficult, but there have been lots of opportunities to heal, and also to grow. We have grown very fond of each other, we’ve all grown very close, and for the most part we all get along really well. And I think when you look at the group, it’s such a strange little group of folks that has come together, bound together by what happened on one day. But we continue to work together, we continue to interact and be friends with one another, not because of what happened, but because we genuinely like each other. So I think it’s been filled with healing, because we’ve all been able to do things together and kind of process things together, but also one of growth, personally, for all of us. It’s about making sure we talk about the importance of turning something devastating into something much more positive. For me, it was running for school board and staying involved in education. For Christina-Taylor Green’s family, it was starting the memorial foundation. For others, it’s about just going to your church and volunteering more, but we’ve all found our own ways to give back to the community. And the thing I enjoy about education is it is a nonpartisan issue, and it allowed me to be able to build bridges and work with people of all stripes and colors, which is something that I think is a lesson that we need to learn from January 8th. What happens to the millions of dollars donated to help victims of mass violence?